Alexei, Ericka’s hubby, here to let everyone know how things have gone with our little man’s heart surgery. As she previously posted, he was born with a Sinus Venosus Atrial Septal Defect (ASD): a hole in the tissue separating the two atria of his heart. As you all should recall from biology class, the atria receive blood back from the body via veins, and the ventricles pump blood out to the body. The right side receives blood from the muscles, organs, and other tissues and pumps to the lungs. The left side receives oxygenated blood from the lungs and pumps it back out to the rest of the body. The ASD causes some oxygenated blood to re-enter the right side, causing it to be re-pumped through. This causes the right side of the heart to have to work harder and can, over time, lead to pulmonary hypertension, expansion of the right side, and over very long time periods, possible heart failure. So it’s something that needed to be fixed, and alas the sinus venosus variety won’t just fix itself. Hence, the need for heart surgery. 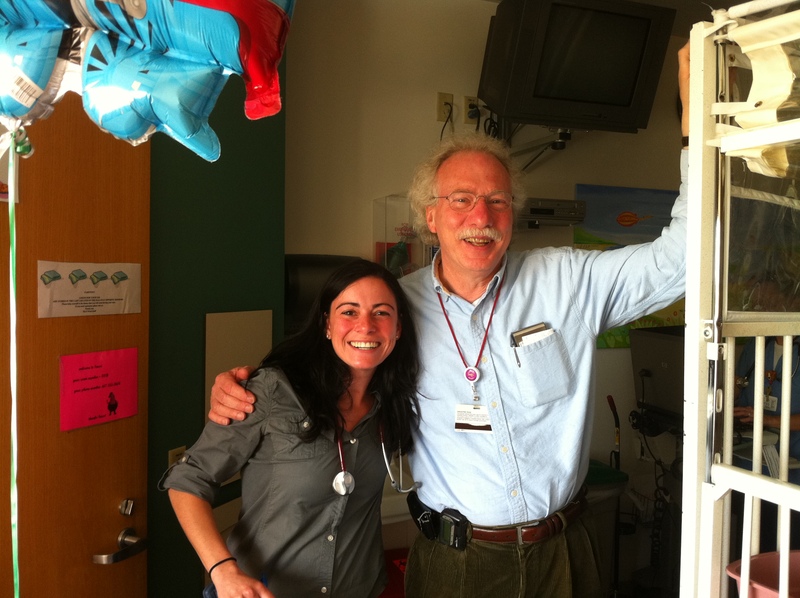 We picked Children’s Hospital Boston because it’s #1 in the country from Pediatric Cardiology. And it was within reasonable driving distance (it takes about 3.5 hours to get to Boston from our house). A no-brainer, from our perspective. Of course, getting the paperwork and approval to come here from Tricare took a bit of doing, but it actually was easier than I thought it would be. So, on Tuesday afternoon, May 3rd, I left work early and we hopped in the car for Boston. I left early because 1) I’m a slacker and 2) we had to check in to the family inn here no later than 7 pm. So we had to get on the road by 3 to make it. We stayed at the Yawkey Family Inn. It’s associated with the children’s hospital, and provides dorm-style quarters for patients’ families for just $30/night. Compared with the going hotel rates in Boston of $200 or so, it’s a great deal! It’s a nice house (apparently, it used to be a Frat House, back in the day) that’s divided up into three floors of rooms, with common bathrooms on each floor, laundry in the basement, and a very nice kitchen, dining area, and rec area downstairs. It was quite comfortable, and just a 10 minute walk to the hospital. On Wednesday, we did a lot of pre-operation testing, received briefings from the anesthesiologist, surgeon, and cardiologist, got tours of the Cardiac ICU and the cardiac ward (aka “The Floor”), and generally got ready for the big game on Thursday. We both were very reassured that all would be well, especially after the briefing from the surgeon. We knew the surgery was something that had to be done, but had unpleasant visions of them cracking Vasili’s chest wide open, having to change out dressings for weeks afterwords, worries about sutures and how to stop him from pulling them out, all that sort of thing. Dr. Fynn-Thompson, the surgeon extraordinaire, set those fears to rest very quickly. For one thing, he wasn’t going to crack Vasili’s chest wide open. He does a minimally invasive procedure (a mini-sternectomy it’s called), whereby he only makes a 4 to 5 cm long incision and only cuts through the lower third of the sternum. He can get away with this because a kid Vasili’s age still has a lot of cartilage in his ribs, and so the doctors are able to move them around more easily. Then, at the end of the procedure, they don’t use sutures: they use the new skin glue that was developed over the last decade and a half for the Army (I’m sure you read about it in some of the war coverage). So no sutures to worry about pulling out. Because of all that, Vasili’s recovery was going to be a lot easier than we feared. We were very happy to hear that. So Thursday at 9 am, we showed up to the admitting office and did the paperwork, then settled in to wait. 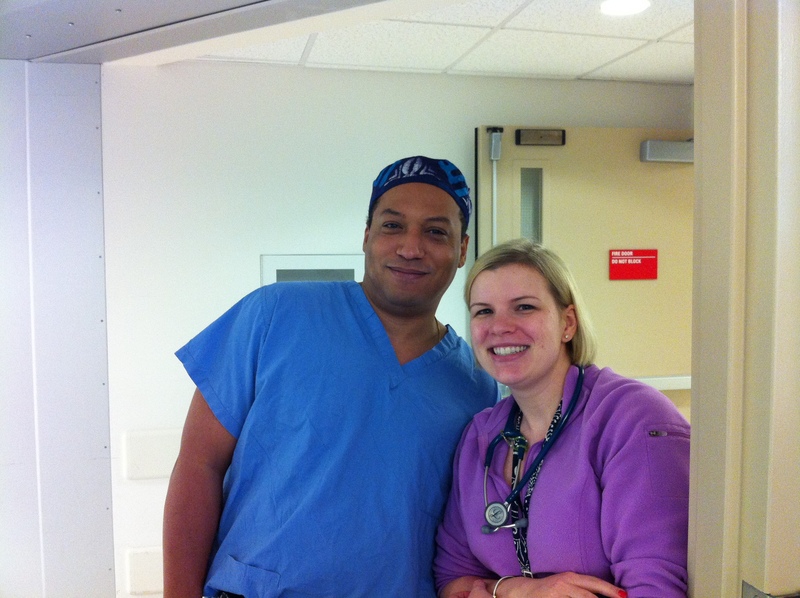 At 11, they called us up to the pre-op holding area, where we met the anesthetic team. The first nurse we met, the one on the left in the picture, was from Russia, and right away asked if we spoke Russian. She seemed disappointed when I told her we didn’t. Oh well, what are you gonna do, right? After a little bit more chitchat, and some last minute briefings, they gave Vasili a drink to pre-lube him for the heavy anesthetic. He got loopy really quickly, and made everyone laugh. Then we gave him a little kiss and put him in the bed, and they wheeled him away for surgery. A different nurse came and led us to the waiting area. They’d advertised a 3-4 hour procedure, so we had some time to kill. We went down to the cafeteria for some food, then Ericka needed to pump out some milk. But that left us plenty of time to kill. We pretty much vegged in the waiting area. Ericka sent some updates to our families over Facebook, and I worked on finishing my book (I finished it Friday morning, in case you’re curious. More details on that at my writing blog). The liaison nurses kept us informed at each milestone (first incision, going on the bypass, coming off the bypass). We were surprised, actually, how quickly the procedure went. It seemed like we’d just gotten word that he was on the bypass when they told us he was off. Pretty amazing. Dr. Fynn-Thompson came and briefed us in the waiting room on the results: flawless victory. He’d found that, in addition to the hole, one of Vasili’s pulmonary veins was draining into the right atrium, so he went ahead and fixed that too. But Vasili was all set: nice and fixed! An hour and a half later, they were ready for us in the ICU, and we went on in to see him. As briefed, he was still intubated, and hooked up to a respirator and a bunch of monitors. But it wasn’t nearly as difficult a sight as we had been led to believe it would be. Frankly, I thought it was pretty cool. But then, I’m a freakish Engineer guy who loves gizmos and gadgets, loves learning how things work. Ericka about tore her hair out telling me to stay away from the various machines, afraid I was going to break something. But I was just looking! Anyway, the nurses on duty in the ICU were awesome: completely professional, friendly, and helpful. We could tell they loved their jobs, and they kept us well informed of what everything meant and what the plan was going forward. Can’t say enough good things about them! That said, it quickly became apparent that we weren’t going to do anyone any good standing around in the ICU all evening. After Dr. Fynn-Thompson checked in with us one last time, we decided to head out. It was a special day: not just Vasili’s surgery, but also our 4-year anniversary! So, following the nurse’s advice, we tried to go to dinner at this place called The Mission Bar and Grill. But, it being cinco de mayo, the place was packed. So we went next door to Friday’s instead for a celebratory dinner. Then we dropped some gear off at the Inn and went back to check on Vasi again. He was still asleep, though he was starting to stir. We at first thought we wanted to be there when he woke up and they extubated him, but talking it over with the nurse, and thinking about it, that began to seem like less of a good idea. For one thing, they probably weren’t going to do it until the wee hours of the morning. For another, she told us it was a really tough thing to watch, and we probably didn’t want to be there for it. Beyond that, he wouldn’t know we were there, since he’d still be looped out on meds. So we decided to just head to the Inn and get a good night’s sleep, since he’d actually need us in the morning. Friday morning, we passed the night-shift nurse leaving the hospital as we were coming in (she’s the one in the picture with Vasili). She happily told us they’d extubated at about 3 am, and he was upstairs watching cartoons. Sweet! He only partially registered our presence at first; he was still pretty loopy. But before long we were interacting. A little. He still had a chest tube in to drain fluid from the area of the surgery. The last thing they wanted to do before transferring him to the floor was to remove that tube: another thing we probably didn’t want to witness. At some point in there, Ericka’s mom, who was at home watching the other kids, called and revealed they were almost out of breastmilk for Liev. Fortunately, Ericka had pumped fifteen bags of milk since Tuesday. The only problem was getting it to them. Well, the hospital’s lactation assistant hooked us up with packaging to ship the milk home, so I ran back to the Inn to get the frozen milk. 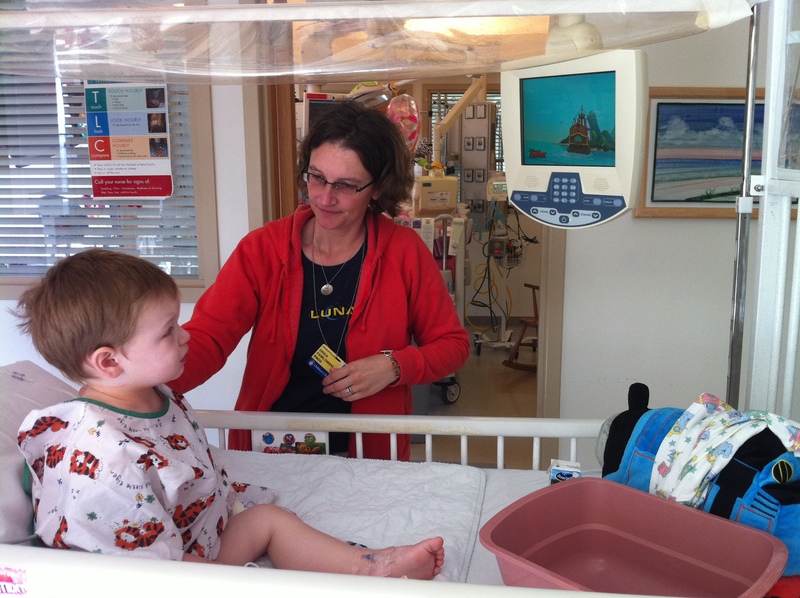 By the time I got back, the chest tube was gone and they were ready to transfer Vasili over. We got to the floor in the early afternoon and have been there ever since. Vasili slept most of the day on Friday, though he woke up s number of times Friday night. Dr. Peter Lang, Vaili’s cardiologist, visited us on Friday. That’s him to the left with one of Vasili’s nurse practioners. Doesn’t her look a bit like Donald Sutherland? Anyway, he pronounced Vasili’s recovery right on track, and said we’d probably be able to leave on Monday, maybe Tuesday. Again, much quicker than I would have thought following open heart surgery! Only one parent is allowed to sleep in the room, so I went back to the Inn that night. I’ve got Vasi duty tonight (Saturday night). The initial plan was that Ericka would just kick me out to the Inn each night, but the sleeper chair in the hospital room is God-awful uncomfortable, and kills her back. So we’re swapping off turns. Today, Vasili was more active. He ate more, talked more, played more. We took him for a ride in a little carriage to get chest x-rays (which he hated), then as payback took him outside into one of the hospital’s gardens. Our timing was perfect, because we got him there in the only 30 minute window of warm sunshine in the entire day. 🙂 Back in the room, we kept him entertained in various ways, even streaming the Kentucky Derby on my laptop. He loved watching the horses! He fell asleep around 7:30 tonight, right around his normal bed time. Since he was up most of the day, I suspect he’ll sleep most of the night too, but I guess we’ll see. So that’s basically it. So far, it’s been a great experience. I can’t say enough great things about the Children’s Hospital Boston facilities and staff. They aren’t #1 for nothing! I’ll leave you with a picture of the man who made it happen: Dr. Francis Fynn-Thompson, as well as the Nurse Practitioner from the ICU. Hats off to him, and the rest of the staff at Children’s, for a job well done! Yay, Vasili! Great job little man!